Alan Cubbage’s office door is a messy scrapbook of his life here at Northwestern – the good and the bad. Assorted flyers, stickers and printed articles describe the highs and lows of his 20 years as vice president of University Relations: a photo of Cubbage shaking hands with President Obama, an old headline about the gambling scandal that rocked the athletics department and the Chicago Tribune story about the Pritzker family’s $100 million donation to Northwestern’s law school. Cubbage has been the public face of the university for two decades, during which he has watched the school he represents grow in size, endowment and prestige. Cubbage arrived at Northwestern in 1997, two years into Henry Bienen’s Northwestern presidency. Back then, members of the class of 2020 were not yet born, the Arch was just three years old and University Hall’s dramatic renovations were still brand new. Things were different. 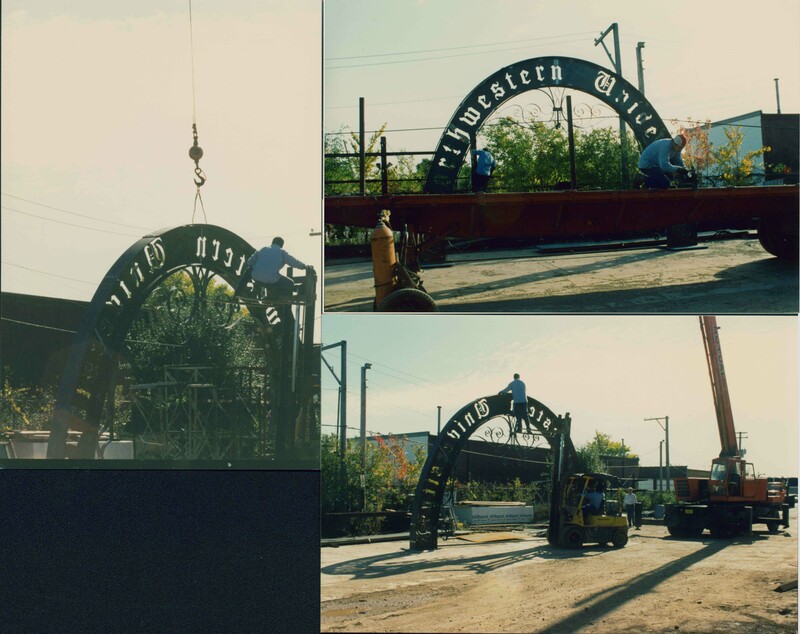 Northwestern was just beginning to reach the national and global heights its name implies today. The effects of its long, tumultuous history and the concerted campaign in past decades to improve its international prestige were just coming to fruition. It may not have been clear at the time, but soon that school in Boston would be overshadowed. Northwestern’s growth has been a long, meandering process, with plenty of moments of defeat among its triumphs and advances, but the underlying goal to consciously propel the school upwards has been present for years. In 1983, U.S. News & World Report published its first “America’s Best Colleges,” and its rankings quickly became a national standard. The report brought 2.6 million unique visitors to the U.S. News website in 2014, securing its status as the most widely quoted report of its kind in the United States. Northwestern first appeared in U.S. News rankings in 1987 at no. 17. 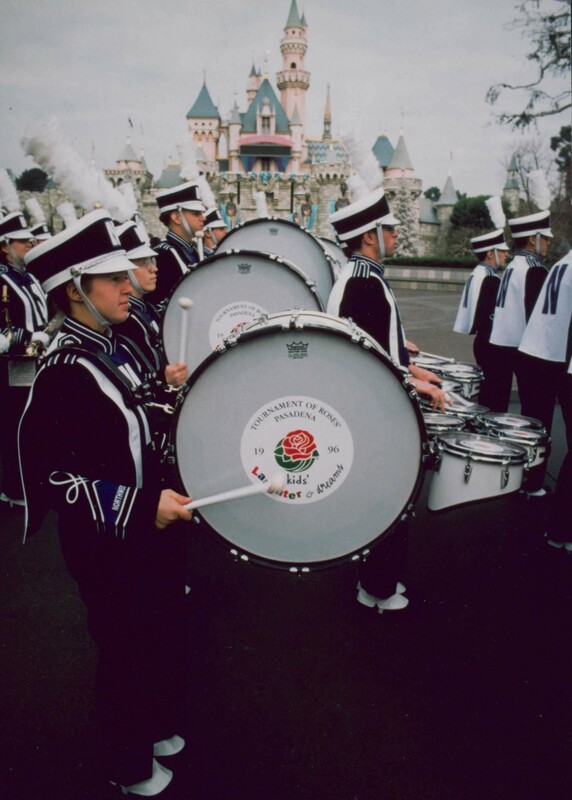 That year, the university’s endowment was roughly $950 million. 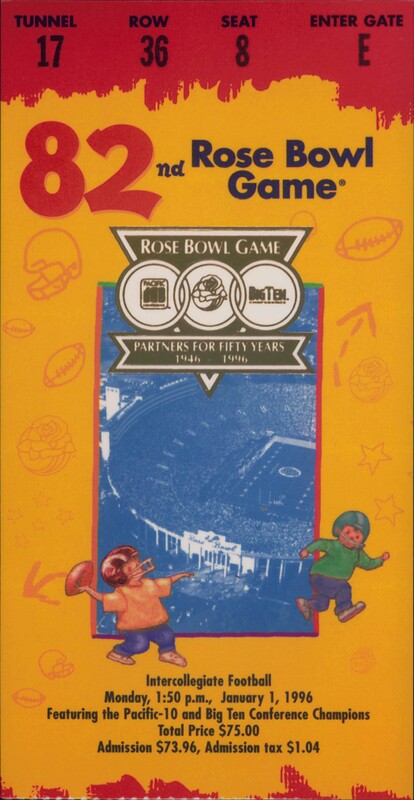 Today, Northwestern comes in at no. 12, tied with the California Institute of Technology. Its endowment has grown to just under $10 billion. And NU has never been more popular nor more selective. More people applied to the Class of 2021, both early and regular decision, than ever before – the university received 37,256 applications, a 6 percent increase from the Class of 2020 – and the overall admissions rate dropped to an all-time low of 10.7 percent. Northwestern wasn’t always like this, even though it often acts like it was. How exactly did NU get to this point? Let’s start at the beginning. The year was 1851. Harriet Tubman was ferrying slaves to freedom as a conductor on the Underground Railroad. London was hosting the first world’s fair. That year, the state legislature of Illinois granted John Evans and eight other men a charter to create a university in modern-day Evanston, despite the land being home to sovereign nations, including those of the Council of Three Fires. They envisioned it as a school that would serve the Northwest Territory, an intellectual haven the region lacked. Though the university was never religiously affiliated, Northwestern’s motto, “Quaecumque sunt vera,” translates to “Whatsoever things are true” and comes from the New Testament’s Book of Philippians. Through the 1870s and 1880s, the university endowment increased in fits and starts, and during this period it merged with three already existing schools of law, medicine and dentistry in Chicago. The best known of those schools, the Northwestern University Pritzker School of Law, remains the oldest law school in Chicago. But two decades of growth for Northwestern were threatened when a rival appeared to the south. In 1890, the University of Chicago was founded with the help of seed money from oil magnate John D. Rockefeller. “It became, overnight, an important academic institution because they had the largess of John D. Rockefeller to build it,” university archivist Kevin Leonard says. Suddenly, Northwestern had competition for the intellectual haven of the Midwest that Evans had envisioned. “It probably served as a spur for Northwestern to up its game,” Leonard says. 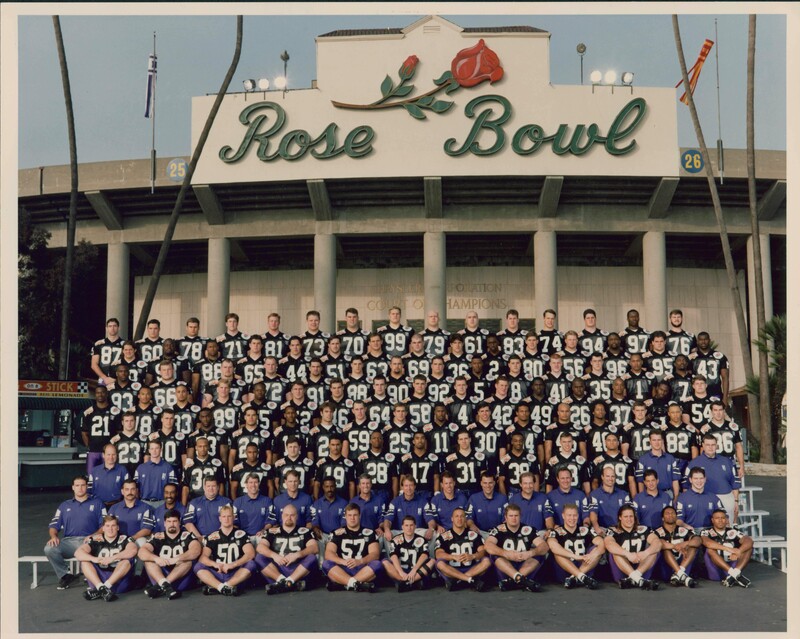 It forced Northwestern to create and develop programs which required more physical buildings, prompting campus development, and Northwestern began working to improve its athletic programs, especially football, in response to U of C athletics. In contrast to Northwestern, the University of Chicago focused on research from the outset. Northwestern’s transition from small liberal arts college to research university took a long stretch of time, and as both schools attracted the populations living around them, suburban Evanston couldn't compete against the dense population of Chicago, Leonard says. 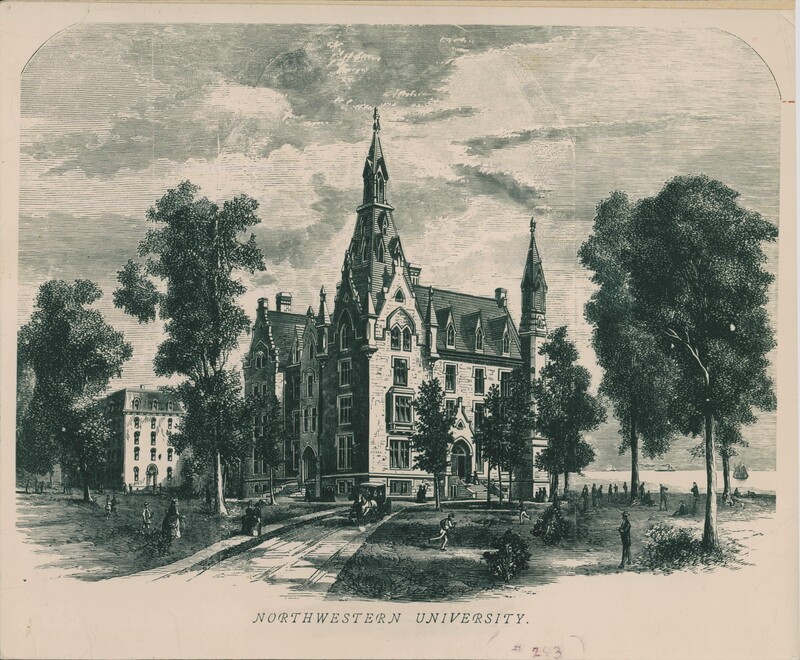 But Northwestern gained status in 1917 when it was invited to become a member of the Association of American Universities, the nation’s premier group of research universities, a tangible recognition of its improvements. On the other side of the world, Russia’s Tsarist autocracy came to a bloody end with the Russian Revolution. In 1920, Walter Dill Scott assumed the presidency. Scott would stay at its helm until 1939, and during his tenure oversaw major changes to campus. The sorority quad, the Chicago campus, Ryan Field (then called Dyche Stadium) and Deering Library were all built under Scott’s oversight. Deering, opened in 1933 and modeled after Cambridge University’s King’s College Chapel in an imposing Collegiate Gothic style, looks strikingly like the University of Chicago’s Harper Memorial Library, built in the same style in 1912. In 1929, the stock market crashed. Like everywhere in the United states, The Great Depression whalloped Northwestern. The University of Chicago also felt financial strains, so in 1933, Robert Maynard Hutchins, president of the University of Chicago, proposed combining his institution with Northwestern to create “the greatest educational enterprise in the world,” as Hutchins said in a memo. President Scott, faced with a dramatic choice, called it “the most important problem ever presented to the Board of Trustees.” Scott lauded the proposal as a way to ensure the university’s stability to board members and alumni. But heavy opposition from both universities, alumni, the city of Evanston and Northwestern’s medical school – whose students burned Hutchins and Scott in effigy – helped kill the deal, to Scott’s chagrin. Ten years after the crash, amidst the chaos and economic collapse still distressing the nation, Scott gave new president Franklyn Bliss Snyder the reins in 1939. President Snyder led the university through a trying financial period. It was difficult to pay staff and professors, and students often couldn’t pay for school, if they enrolled at all. On top of that, World War II descended upon the still-struggling nation like a powerful rapid. The draft swept up Northwestern’s male students and faculty for the war effort, leaving a largely female campus. Snyder’s tenure only lasted a decade. In 1949, J. Roscoe Miller, the well-connected and admired former dean of the medical school, stepped in to take Snyder’s place. In the midst of the country’s new feeling of optimism and prosperity, President Miller used his influence to improve the school’s academic stature. “He was able to get people in the university to buy into ambitions to improve it, to grow it, to renovate and construct new physical facilities,” Leonard says. Northwestern saw more applicants than it had in the previous years as soldiers returned from the war, eager to finish their academic careers. The Servicemen’s Readjustment Act of 1944, also known as the G.I. Bill, gave veterans a gateway into academics by providing a range of financial benefits to help pay for school. Unfortunately, the campus did not have the space to house all its new enrollees, and temporary shelters were a common sight on campus for years. Deering Meadow was filled with Quonset huts: lightweight, steel half-cylinders with no heating or electrical system, which housed veterans and their families. Miller’s most tangible accomplishment lies green and beckoning to the east. 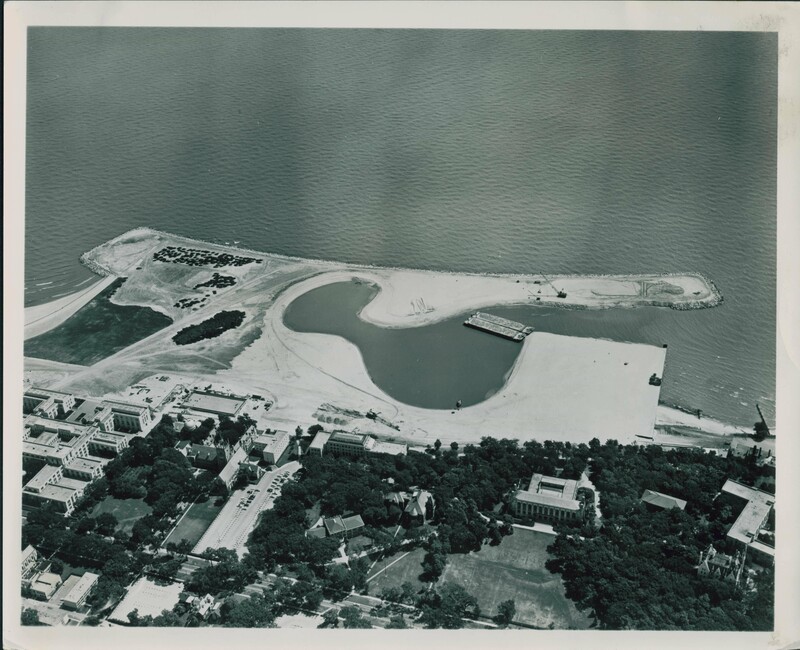 The Lakefill, a key feature of today's Northwestern landscape, was completed in 1964. Envisioned as “the canvas on which others can paint their buildings, their laboratories, classrooms,” according to Leonard, and briefly known as the James Roscoe Miller campus, the Lakefill was created by turning reclaimed land from Lake Michigan into a seawall of limestone blocks and literally building on the lake. This addition almost doubled the size of the previously 85-acre campus. His mission became complicated when outrage over the Vietnam war bubbled over onto campus. 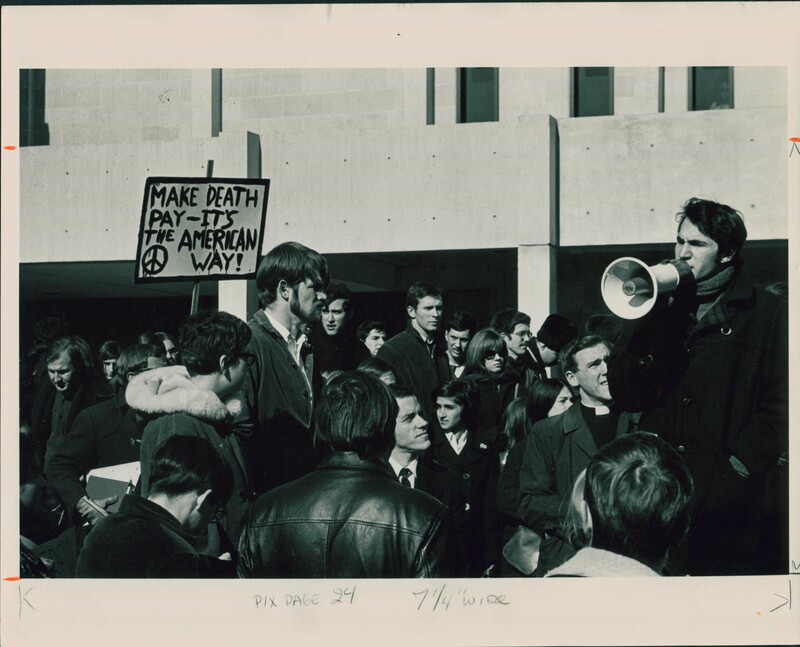 In May of 1970, along with dozens of other campuses, Northwestern erupted into a slew of protests in reaction to the Kent State incident. After 5,000 students rallied on Deering Meadow and 2,000 gathered at Rebecca Crown Center, Miller, with support from the Faculty Senate, canceled three days of classes and shut down administrative offices. The Miller administration attempted to navigate this tumultuous atmosphere, making changes based on dialogue with student leaders. The Board of Trustees sat down with students in closed meetings, hoping to ease the tensions and understand their concerns. But students continued to call vocally for Miller’s termination, and his 21-year tenure ended among almost constant political protests. Robert H. Strotz took his place as president in 1970, but that didn’t soothe tensions on campus. The Daily Northwestern and the Associated Student Government objected to his appointment, largely because Strotz opposed closing the campus during the Kent State protests in May. But the frantic politicization of the campus slowly quieted to a murmur as the U.S. finally pulled out of Vietnam in 1975. Strotz used the rest of his time as president to shift the school’s focus towards academics and fundraising – especially as the economic troubles of the ‘70s were felt at Northwestern. By the end of his presidency, Strotz’ financial prowess had saved the school from further economic downturn. He had nearly doubled the school’s endowment, but budget problems continued to make themselves apparent in the ‘80s. The administration declined all salary increases for faculty in 1982 – a year where the school’s deficit hit a record $12 million. To succeed Strotz, Northwestern brought in Arnold R. Weber, who was president of the University of Colorado and Northwestern’s first outside presidential hire in decades. Weber was focused on increasing the school’s academic reputation and stabilizing university finances, a major concern of the Board of Trustees who had courted him. "I’d like this school to be clearly identified in the first rank of American educational institutions." Weber’s background in administration gave him confidence as he entered Northwestern. His assertive decisions, which included putting hard limits on departmental budgets, often came at the expense of his popularity. But this didn’t seem to bother Weber too much. He had a greater vision for the school, and the road to realizing this vision wasn’t necessarily going to be easy. Weber took over in a world made newly small by advances in media and communication. Suddenly, Northwestern had a chance to gain name recognition on a national level, not just a regional one, and he worked to make this a reality. Weber began by focusing on academics. In 1985, The New York Times opened an article titled “Northwestern Dreams of Moving Up” by saying the school “plays second fiddle academically to the University of Chicago.” Weber was aware of this perception and made an intentional and concerted effort to push Northwestern into an elite group of academically renowned universities. It would play “second fiddle” no longer. "I’d like this school to be clearly identified in the first rank of American educational institutions," Weber told the Times. Right now, I think it is in that range, but there is some ambiguity about it." And the metrics to measure his progress appeared just as his plan did: U.S. News started ranking schools during Weber’s presidency, and partially thanks to his sustained effort, NU made the list for the first time in 1987. By focusing on and investing in Medill, Kellogg, the School of Communication (then Speech) and graduate programs like law and medicine, Weber envisioned the Northwestern of today – one close to cracking U.S. News’ top 10 and hitting single-digit admissions rates. Henry Bienen became president in 1995, turning his focus onto sports, student life, and high caliber research. Bienen was previously the dean of the Woodrow Wilson School of Public and International Affairs at Princeton University and director of Princeton’s Center of International Studies. His administration experience at a prestigious institution made him an ideal candidate to continue what Weber had started. Bienen worked to make the school a place that students wanted to go, a view that helped build the Northwestern we know today. Under Bienen, campus saw the construction of the McCormick Tribune Center (now the McCormick Foundation Center) in 2002, the Ford Design Center in 2005, and added an Asian American Studies minor after student protests. He helped increase the university’s endowment and established Northwestern’s global presence with the founding of the Qatar campus in 2008. Bienen, a sports fan, also invested in Northwestern’s athletic programs. 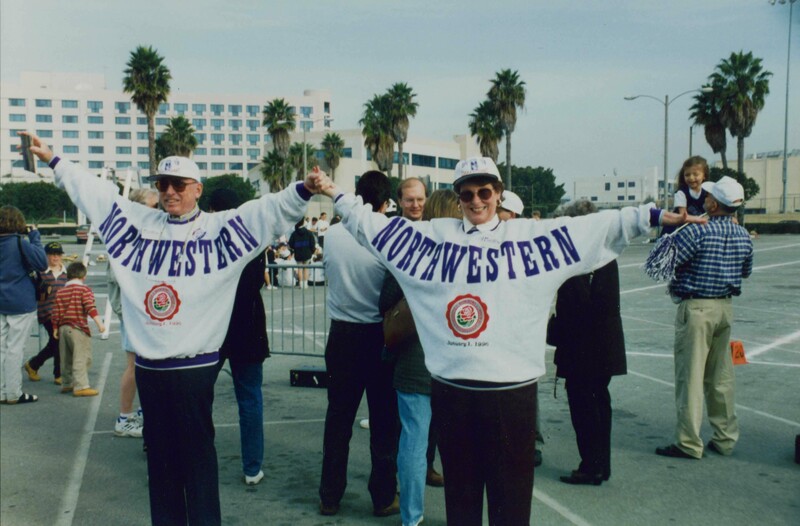 So when Cubbage first interviewed at Northwestern during the beginning of Bienen’s tenure, he found the Office of University Relations buzzing with excitement after Northwestern made it to the 1996 Rose Bowl, a proud moment for Bienen and a watershed moment for the Wildcats. Suddenly, Northwestern’s name was everywhere, and huge marketing opportunities became possible, Leonard says. Another extremely impactful event during the Bienen administration was the development of Lyrica, a drug used to treat epilepsy, neurological pain and anxiety. In 1990, Northwestern chemistry professor Richard Silverman developed the chemical pregabalin, Lyrica’s core ingredient. “It was what’s known as a ‘blockbuster drug’ for Pfizer [the company that first marketed Lyrica], which means that it sells about a million dollars a year worth of that drug,” Cubbage says. Because a Northwestern faculty member made the discovery, Silverman and the university received royalties off of sales of Lyrica. Northwestern also sold portions of the royalty rights on two occasions, once for $700 million and again later for an undisclosed figure. Today, between royalties accrued, the sales of patent rights and interest on this revenue, Northwestern has received around $1.4 billion. Bienen’s decision to invest Lyrica revenue in the endowment, rather than on specific projects, changed the direction of the university. “President Bienen was very emphatic that rather than spending the money on building a new building or something like that, you put them in the endowment,” Cubbage says. Northwestern uses around 5 percent of the annual dividends and interest from the endowment towards its operating costs each year. As the endowment grows, through interests and other sources (like the sale of Lyrica), annual interest accrued grows as well. That means that 5 percent of the annual endowment earnings grow each year as well. In theory, Cubbage says, Northwestern has $50 million more in discretionary spending each year, but the numbers fluctuate year to year. Bienen used this system to focus on certain areas within the university, Cubbage says. “President Bienen put a lot of it into graduate education and a lot of it into financial aid, and that has continued over the course of the years,” he says. When Bienen stepped down in 2009, Northwestern was radically changed. It had gone from the lesser option in the Chicago area to an internationally recognized academic powerhouse, an institution with a mighty endowment, shiny glass buildings and dramatically increased applications. This was the Northwestern Morton Schapiro inherited, and the Northwestern he became responsible for leading into a new age. While Cubbage has worked at Northwestern, both administrations have consciously taken step toward moving the school up in the rankings. However, rankings became increasingly controversial as the 21st century rolled around. Willard Dix, a college counselor and consultant, and former associate dean of admissions at Amherst College, is a well-known critic of university ranking systems. “The people who are most concerned with rankings are really concerned with status, not education,” Dix says. “I think some of the worst ways to rank would be looking at applications and yield, things like that. Since the rankings came out, the need to reject more students every year has become a measure of goodness, the assumption being that the more selective you can be, the better students you’ll have, and that makes you a better school.” Yet Dix acknowledges that it’s tough for schools today to reject that system because of how competitive the world of college admissions is. “It would be hard to be a dean of admissions or enrollment manager right now because you’re really on pins and needles to make sure you get the right number,” Dix says. Chris Watson, Northwestern’s dean of undergraduate admissions, was dealing with getting the right number in early February. The reading season for regular admissions was in full swing, and the mood in the office was eerily quiet. This is understandable: the admissions office is responsible for whittling a pool of more than 37,000 applicants to around a tenth of that number. “We have some momentum, and I think there’s always the idea that we want to maintain our momentum, in terms of the school’s popularity,” he says. Watson’s task for the coming years is to select the best of the best applicants “to strengthen year after year our academic reputation as one of the best universities in the world,” he says. And crucially, Northwestern has started to work on managing its image – not a concern it had historically needed to worry about. To help with this effort, Mary Baglivo was named vice president of global marketing in 2013. Watson, who came to Northwestern at the tail end of Bienen’s presidency, compared Bienen to Schapiro. “Bienen certainly wanted to strengthen the academic caliber of the student who was enrolling to broaden and strengthen the quality of the applicant pool,” he says – and Bienen did, making a world of difference for the university. Schapiro has focused on other areas of the undergraduate experience, especially financial aid. Now that Northwestern already attracts such bright and accomplished applicants, the school's job is to convince those accepted to actually attend. The university’s branding and image today emphasizes the school’s selectiveness. The attitude of the administration and their confidence in the university’s prowess makes it seem like a place that has always been prestigious – the kind of college acceptance that impresses your friends’ parents – but this level of status hasn’t always been there, even if sometimes we pretend it has. What do we lose when we focus on rankings?